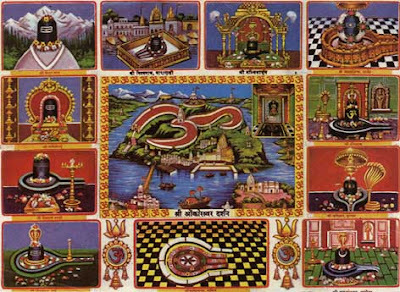 Jyotirlinga Temples, also spelled Jyotirling temples or Jyotirlingam temples, are the 12 temples of Shiva where Lord Shiva is worshipped in the form of a Jyotirlingam or "the Lingam of Light". These 12 Jyotirlinga Temples or Dwadasa Jyotirlinga shrines are situated on various parts of India. Here is a list of the 12 Jyotirlinga Temples of Shiva in India. Somnath Temple in Gujarat is the first among the 12 Jyotirlinga Temples of Shiva. The temple is located at Prabhas Patan or Somnath Patan, 7 km from Veraval in Saurashtra, on the western coast of Gujarat, India. Somnath literally means “The Protector of (the) Moon God” and legend has it that Lord Shiva Dev, pleased by the prayers of the Moon God (Soma), decided to rest in this Lingam till eternity, and thus the name Somnath Temple. Srisailam Mallikarjuna Temple is the second of the 12 Jyotirlinga Temples of Shiva. Also known as Bhramaramba Mallikarjunaswamy Temple, the shrine is situated at Srisailam in Nallamala Hills, Kurnool district in Andhra Pradesh. This ancient temple is dedicated to Lord Mallikarjuna Swamy (a form of Lord Siva) and Devi Bhramaramba (a form of Goddes Parvathi). Guru Adi Sankaracarya composed one of his famous works the Sivananda Lahari (Shivanandalahari) here. Mahakaleshwar Jyotirlinga Temple is situated in the historic city of Ujjain in Madhya Pradesh, India. The Shiv Linga at Mahakal is believed to be Swayambhu linga, and the temple is one of the 12 Jyotirlingams in India. The idol of Mahakaleshwar faces south, and hence is known as Dakshinamurti or Dakshinamurthy – a form of Shiva as Guru (teacher) of all types of Knowledge, especially the Jnana. Omkareshwar Jyotirlinga Temple is situated on the banks of Narmada River, in Khandwa district of Madhya Pradesh, India. Omkareshwar Temple is located on an island called Mandhata or Shivapuri in the Narmada River. The most interesting feature is that the shaped of the island is in the form of the Hnidu Om (Aum) symbol. There are two Hindu temples here – one is dedicated to Omkareshwar and the second one Amareshwar. Kedarnath Jyotirlinga Temple is one of the holiest Lord Shiva temples in India, situated atop the Garhwal Himalayan range near the Mandakini River in Uttarakhand district. Kedarnath Temple is the northernmost among the 12 Jyotirlinga temples of Shiva. Kedarnath forms part of the Char Dham pilgrimage and is open only for six months in a year, starting on the Akshaya Tritiya day and closing on Bhai Bij or Bhai Dooj (October end or November first week). Bhimashankar Temple is one of the 12 revered Jyotirlinga shrines of Shiva. The temple is situated in Bhorgiri village, around 50 km north-west of Khed, in Maharashtra, India. Bhimashankar Jyotirlinga Temple is 110 km away from Pune. Kashi Vishwanath Temple is one of the most sacred Hindu temples in India, dedicated to Lord Shiva. Kashi Vishwanath Jyotirlinga Temple is situated on the banks of holy Ganga River in Varanasi, Uttar Pradesh. Trimbakeshwar Shiva Temple or Tryambakeshwar Temple is a famous Jyotirlinga temple situated in Trimbak town in Nashik District of Maharashtra, India. Trimbakeshwar Jyotirlinga Mandir is locates on the banks is the sacred Godavari River. Vaidyanath Temple also known as Baidyanath Temple is one of the twelve Jyotirlinga temples in India. The location of Vaidyanath Temple is much debated. Some people claim that the Vaidyanath temple located at Deogarh in Bihar is the Jyothirlinga shrine. While Baba Dham Temple or Baidyanath Dham Temple in Deoghar in the Santhal Parganas division of the state of Jharkhand, India. Nageshvara Jyotirlinga Temple is regarded as the first Jyotirlinga Temple on the earth. There are 3 popular temples in India, which are regarded as identical to this Jyothirlinga temple. They are the Nageshwara temple situated on the route between Dwarka and Bet Dwarka Island, on the coast of Saurashtra in Gujarat; the Jageshwar temple near Almora in Uttarakhand state and the Nagnath temple in Aundha in Maharashtra state. Rameswaram Ramanathaswamy Temple in Tamilnadu is the southernmost of the 12 Jyotirlinga shrines of India. The ancient Rameshwar Temple is built in traditional Dravidian architecture and is dedicated to Ramalingeswarar (Lord Shiva). Situated on the in the island of Rameswaram, Rameswaram Ramanathaswamy Temple is believed to be the place where Lord Rama have prayed Lord Shiva to expiate any sins for killing demon king Ravana.